Mist curls, rises, swirls over the Snake River in the light of early dawn and a full moon. It is the morning of the autumnal equinox. The air is calm and chilly, about 42 degrees. A touch of autumn color tints a few trees. Pileated woodpeckers and a northern flicker sound their ringing calls in the woods. A small group of black-capped chickadees gurgle softly to each other as they hunt for insects in the hazelnut bushes on the riverbank. 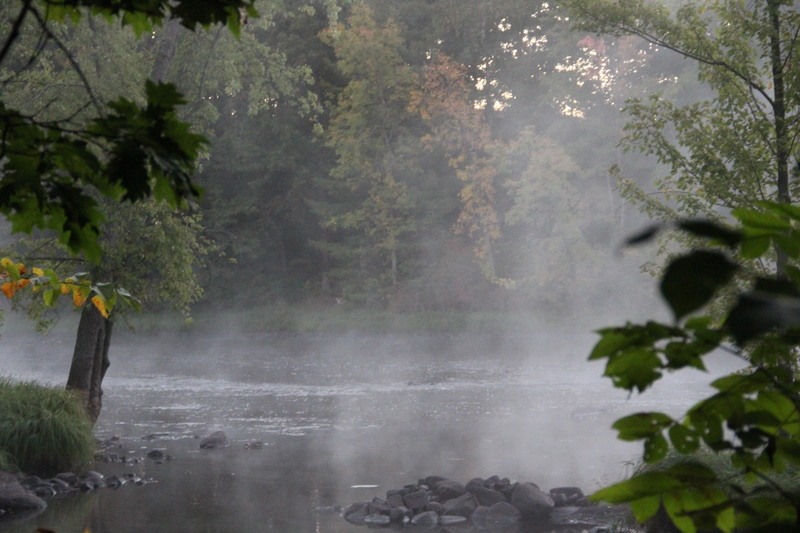 In a few minutes, the sun will rise, the mist will vanish and the day will gradually warm to 70 degrees. But for now, the river valley is hidden and serene. 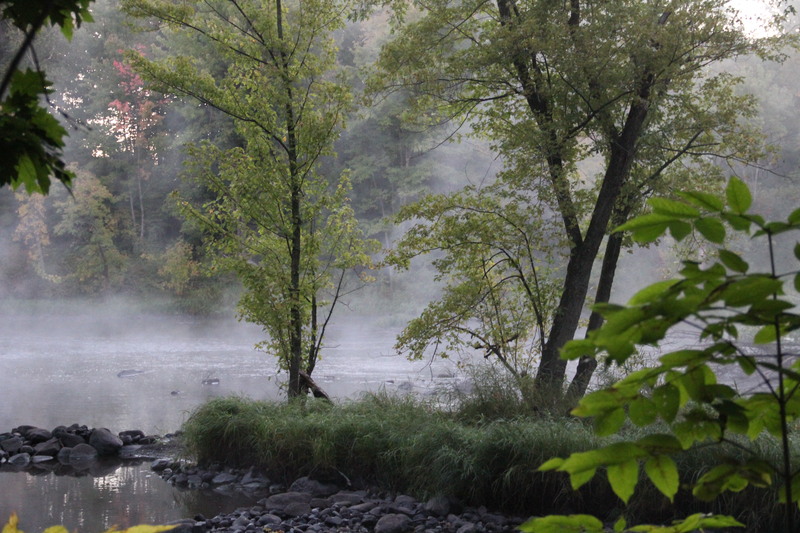 Early morning mist swirls over the Snake River in Pine County, Minnesota. Autumnal equinox on the Snake River. 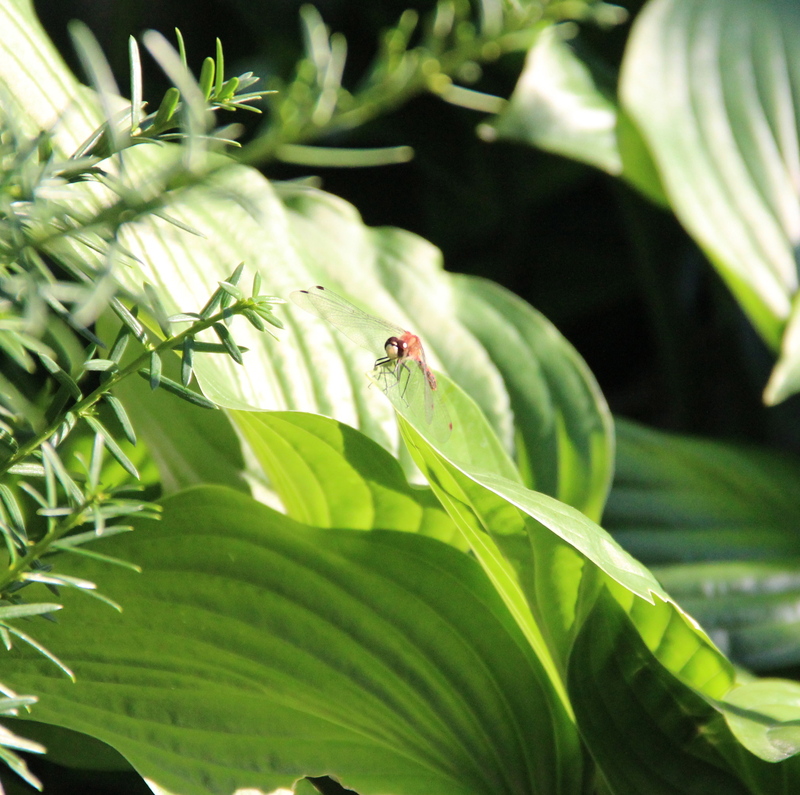 A splash of bright red flashed by as I counted monarch butterflies in our garden late Wednesday afternoon. 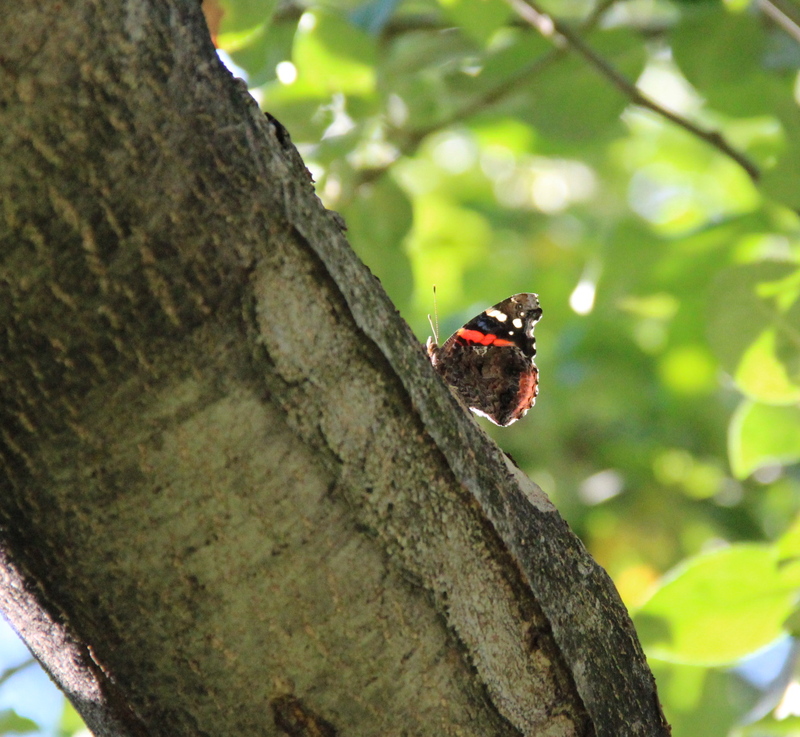 Perched in a sunny spot on the apple tree trunk, a red admiral (Vanessa atalanta) fanned its wings, flew around the backyard a couple of times and landed on a lower limb of the tree. 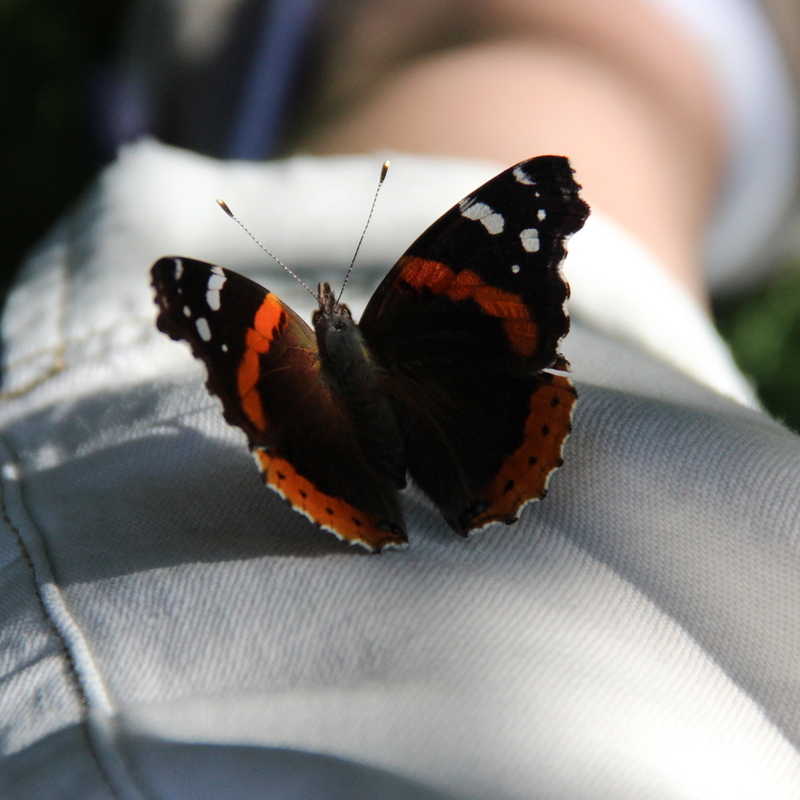 The red-barred upper wings of a red admiral that perched on my leg. Named for the red-bar markings on their black upper wings, red admirals also sport white marks in the upper corners of the forewings. The underside of the wings, which is often visible when the butterfly perches, is a mottled brown, tan and black, with a pink band and white spotting on the forewing. The mottled underwings are marked with a pink bar and white spotting in the forewings. Red admirals range from near the Arctic Circle to as far south as Guatemala. (They also live in Europe, Asia and North Africa, and have been introduced in other parts of the world.) 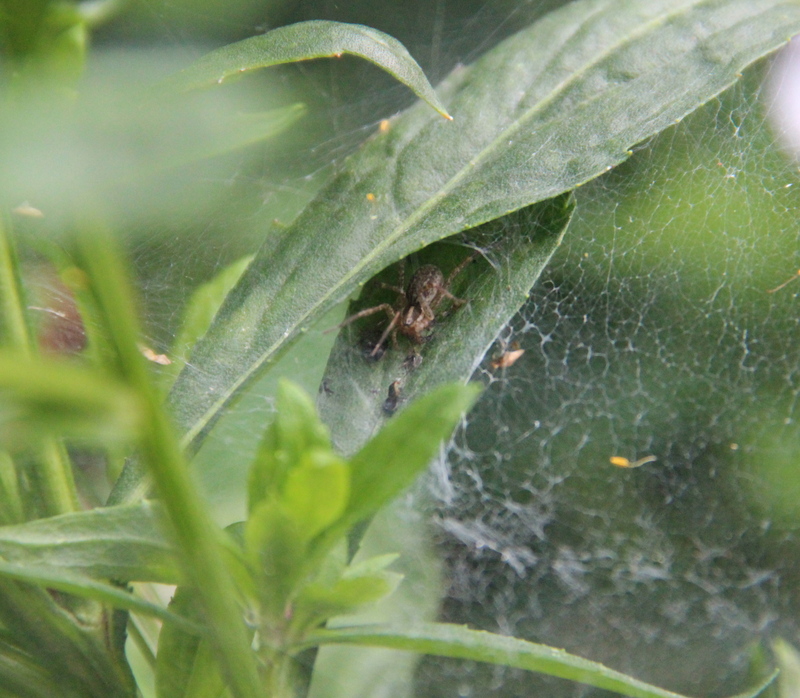 They prefer moist areas such as fields, meadows, open woodlands, gardens and yards. 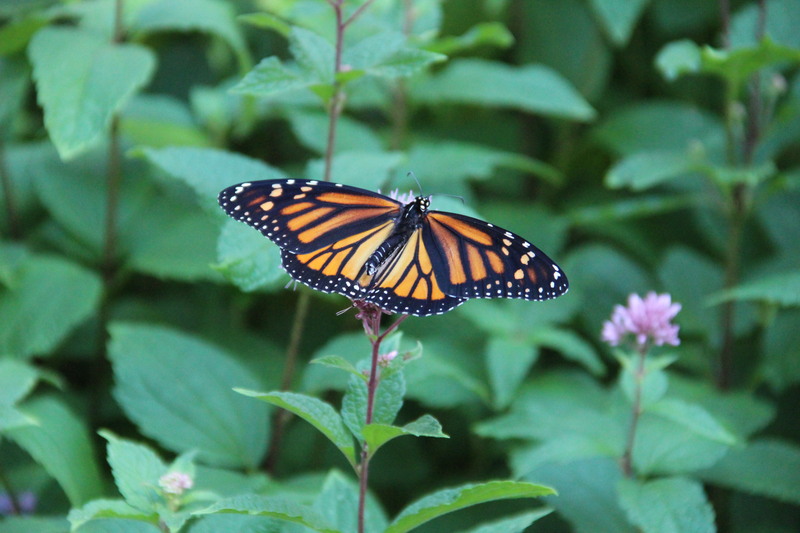 Red admiral caterpillars prefer to eat nettle leaves; adults eat overripe fruit, tree sap, and the nectar of many types of flowers, such as aster, blazing star, spotted Joe-Pye weed and red clover. In Minnesota, there are one-to-two broods each year. 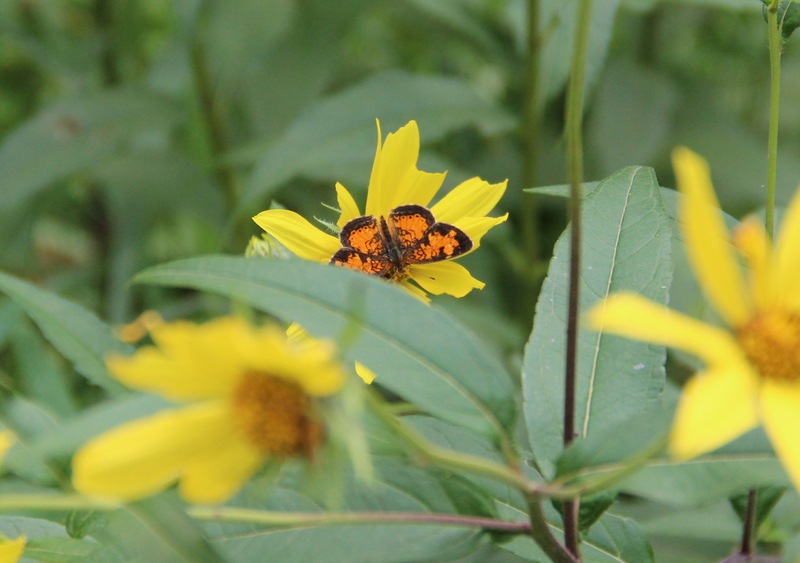 The butterflies of the second brood are smaller and less colorful than the first brood. Most migrate to the southern states in autumn, but a few successfully hibernate in the north during mild winters. 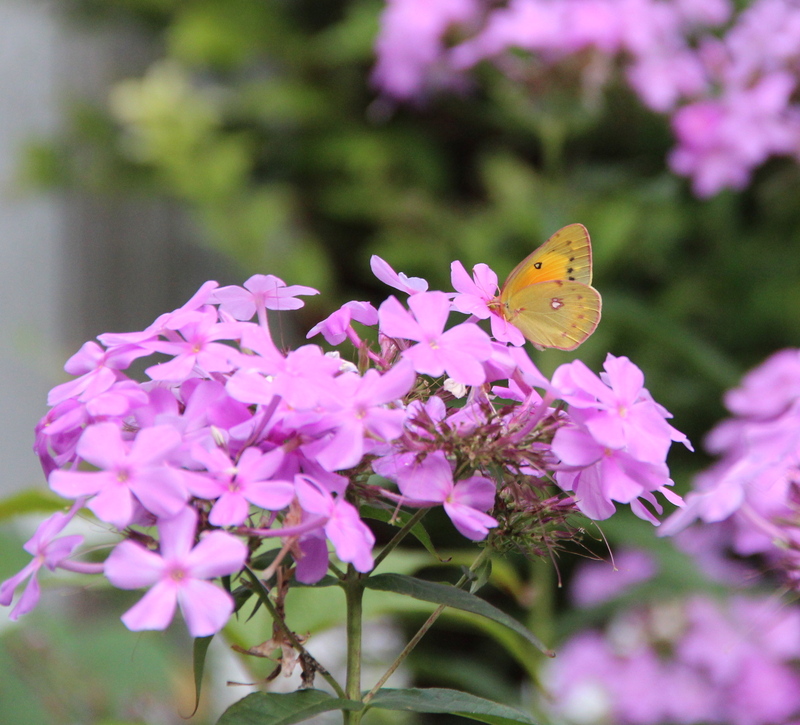 Many years, this butterfly remains active into October and I’ve seen them as early as mid-April in the spring. 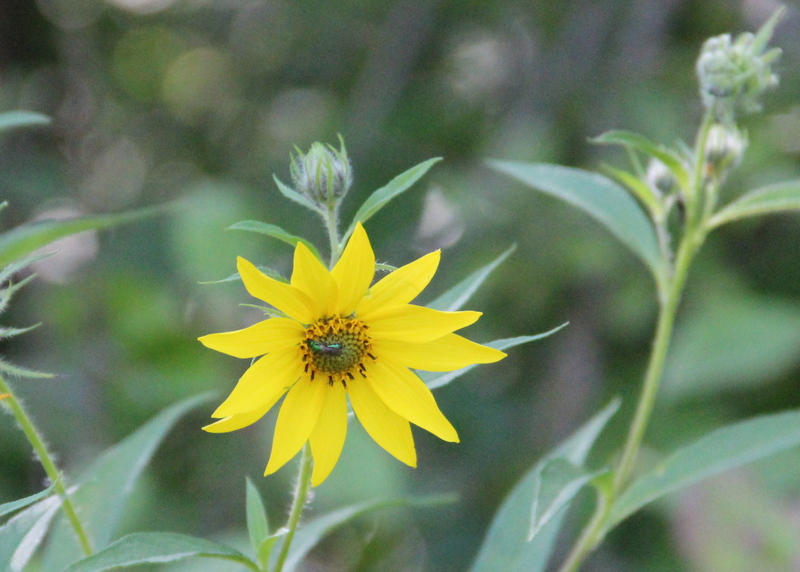 Metallic green bee on a native sunflower known as Jerusalem artichoke. 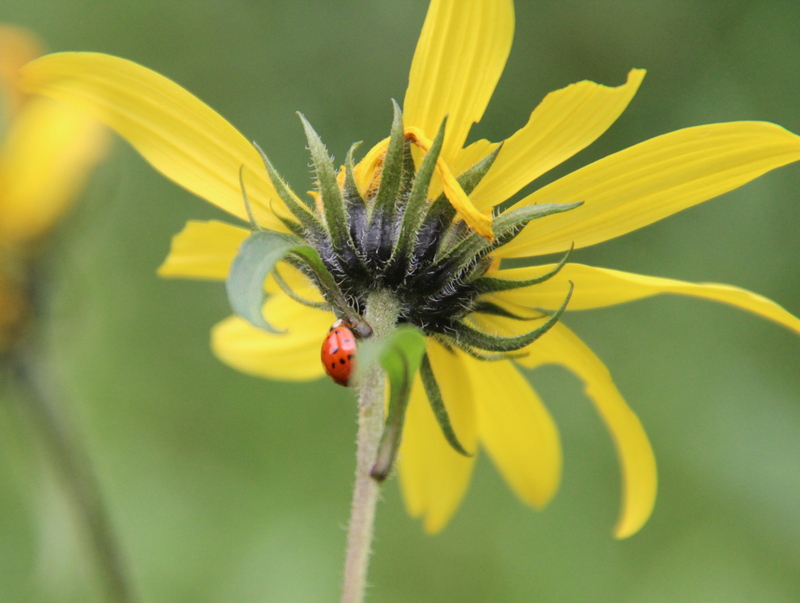 Ladybird beetle on a native sunflower (Helianthus tuberosus L.). 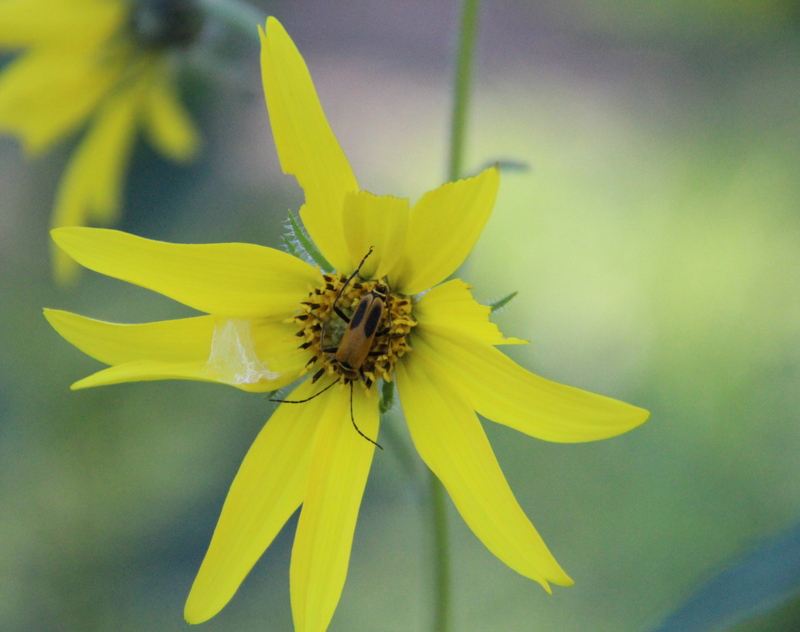 Goldenrod soldier beetles are important pollinators of native sunflowers, goldenrod and tansy. A crescent butterfly, most likely a northern crescent, sips nectar. 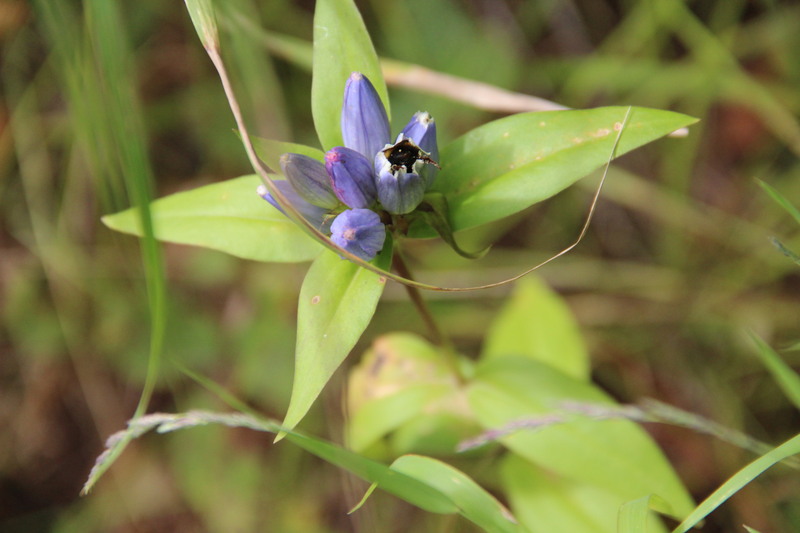 One of my favorite late-summer wildflowers is the bottle gentian (Gentiana andrewsii), which grows in sunny, moist patches along the dirt road next to our cabin. 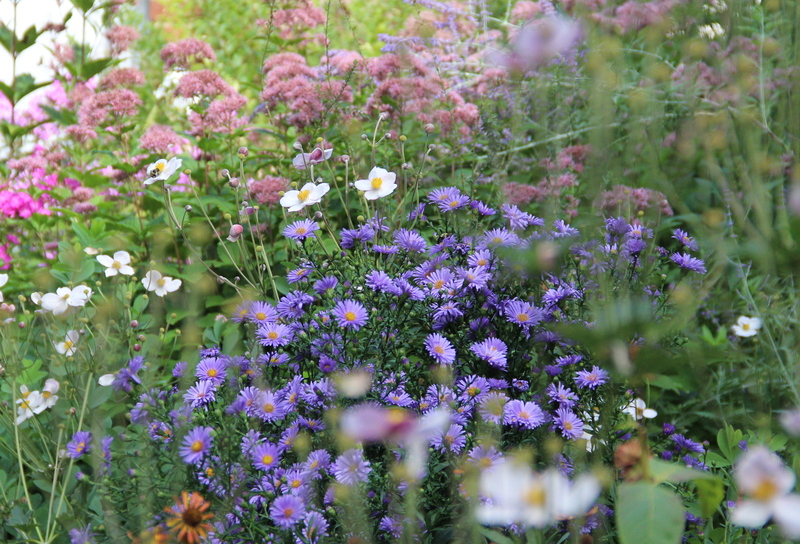 The tightly closed oval flowers, which never open into a blossom, are all deep blue so far this year, but in the past, I’ve also seen powder blue, pearly white, and light pink blooms. 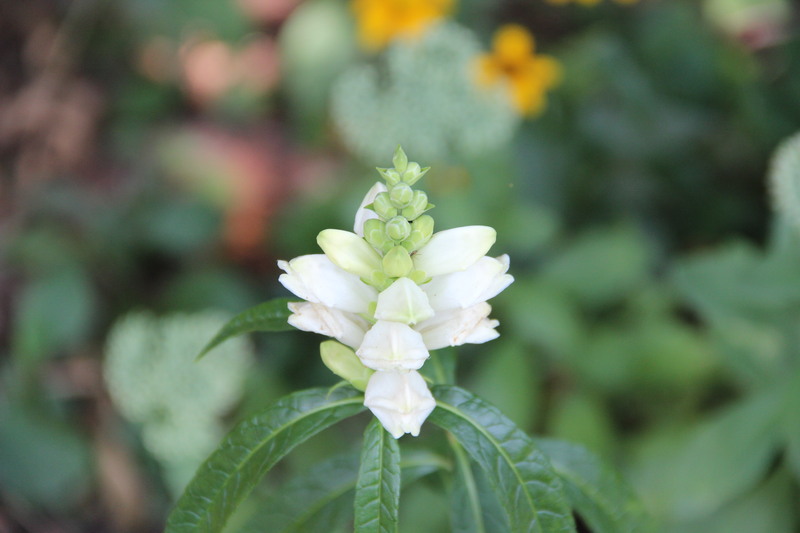 The plants are about 18 inches tall and the flowers are clustered together at the top. 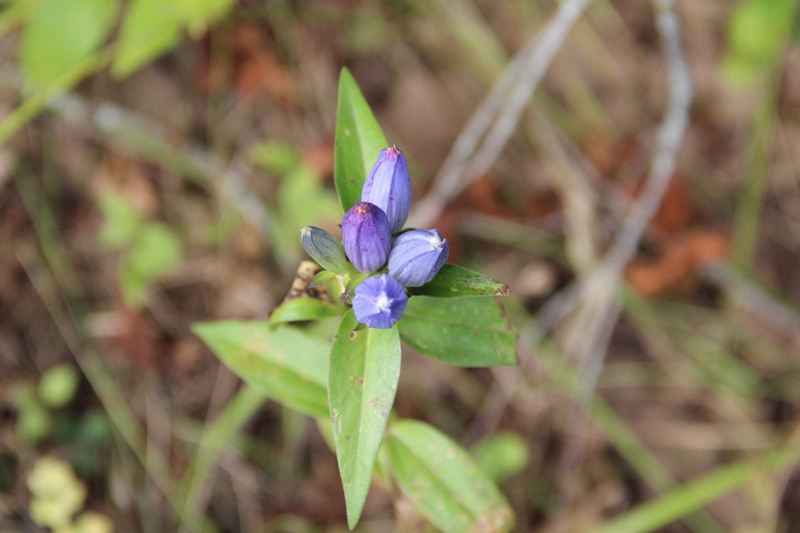 Bottle gentians grow in sunny, moist patches. 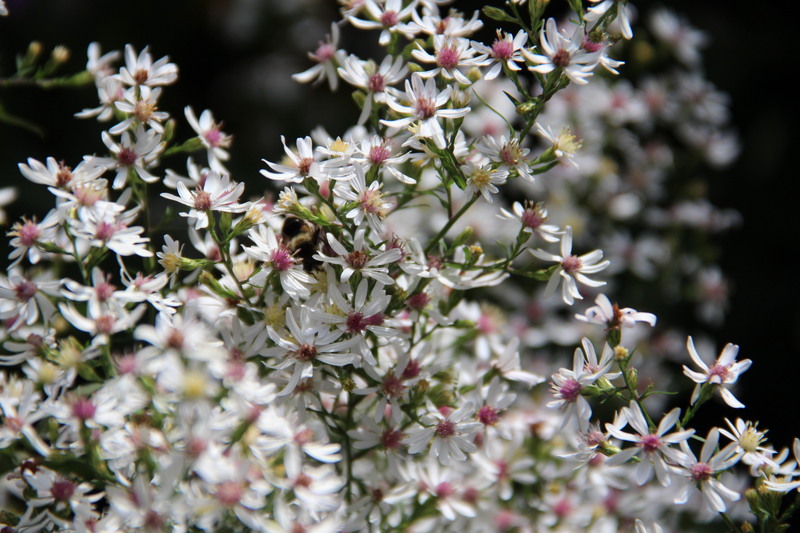 Because the blooms are narrow and closed, they primarily are pollinated by bumble bees, which are strong enough to wiggle their way into the flower. A bumble bee pollinated several of the blooms on the bottle gentian that I was photographing. 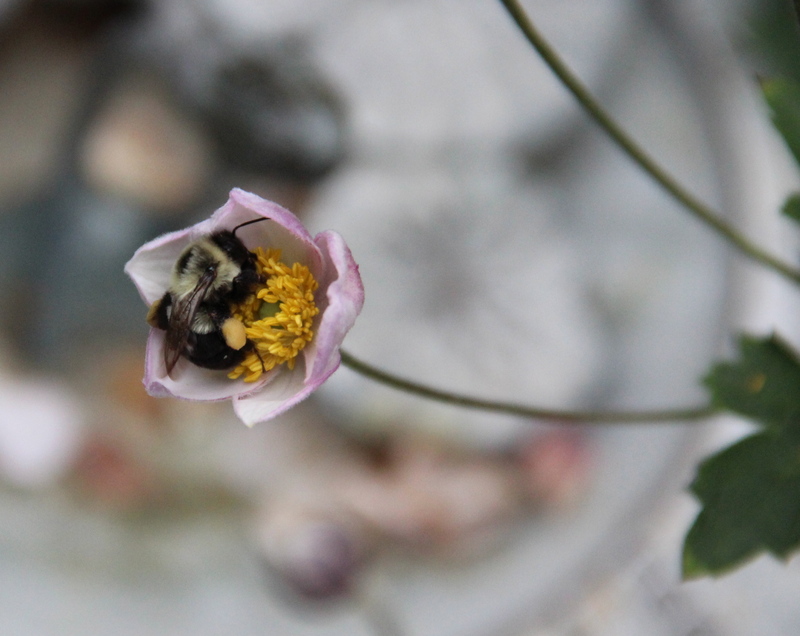 A bumble bee pushes its way into the closed bloom. 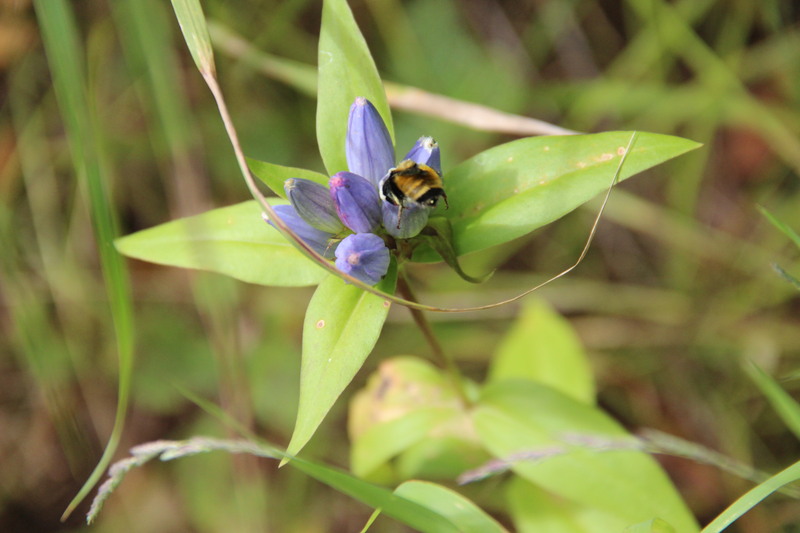 After pollinating the gentian, the bumble bee backs out of the flower.